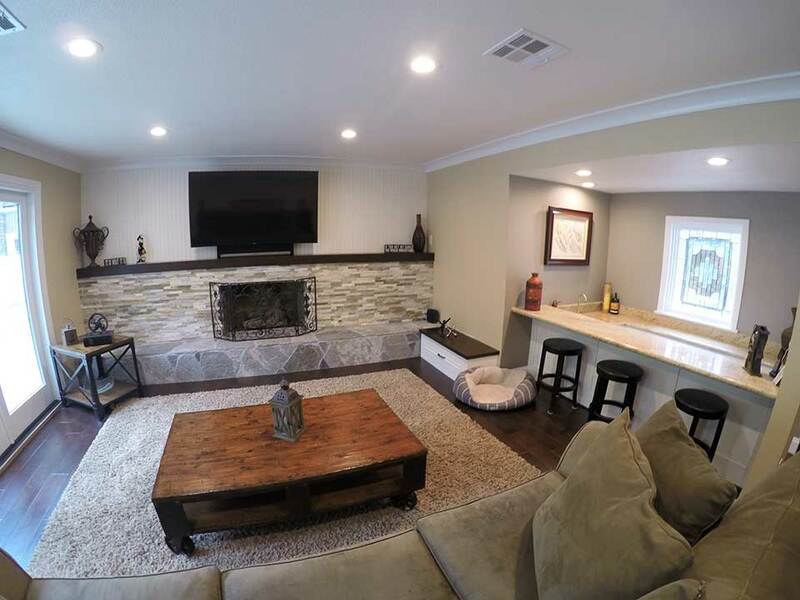 The owners of an expansive Santa Ana house wanted to freshen it up with a new look, and contracted APlus to carry out the full-home renovation. 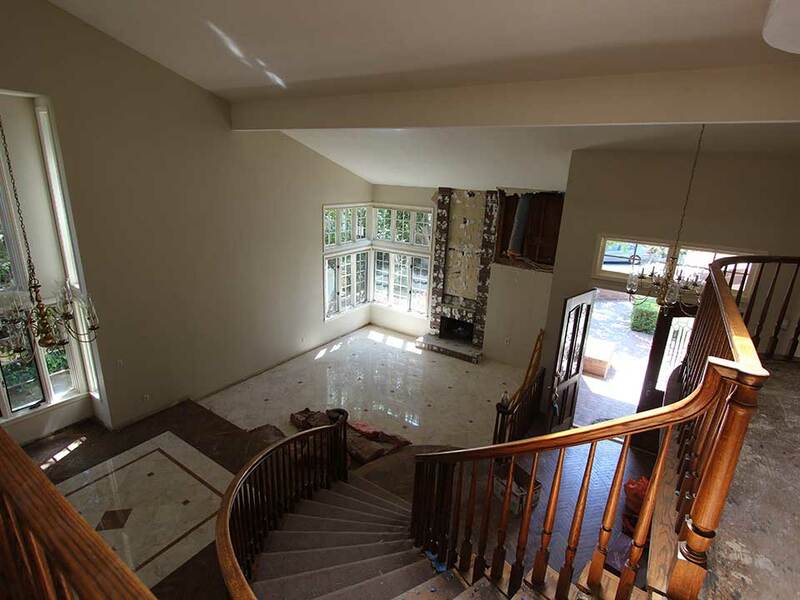 Prior to our remodel, the home lacked a consistent style. The rest of the home was bright and airy, while the kitchen’s old oak cabinets and dark appliances only absorbed the room’s natural lighting. 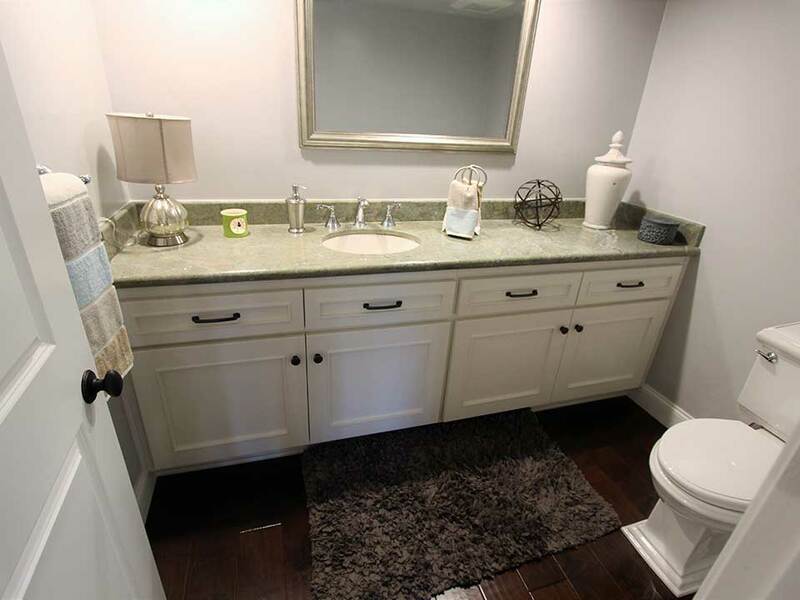 Additionally, the various storage options in the kitchen and other rooms were lacking. 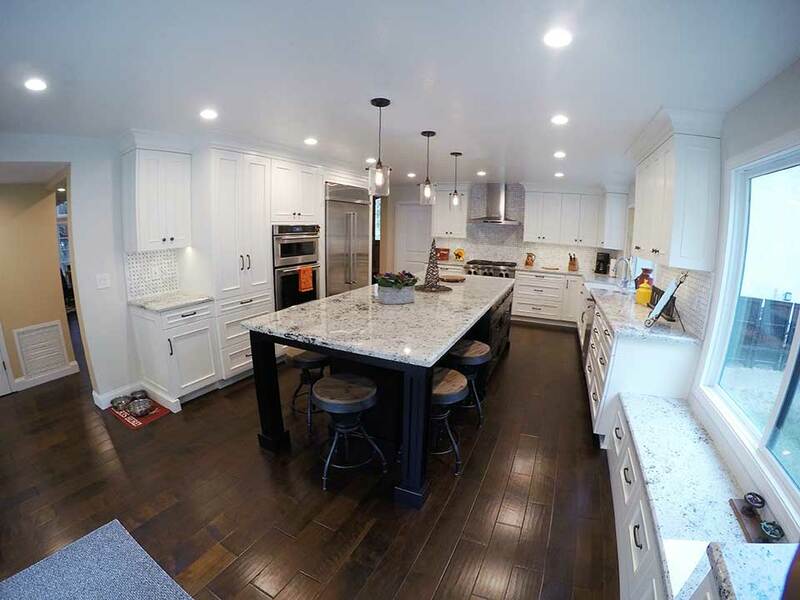 Our goal was to refine the home with a cohesive transitional design, and install custom cabinetry in key areas to make storage more practical and efficient. In the kitchen, we sought to maximize the amount of workspace available, while introducing some options for casual seating. The airy U-shaped layout provides ample space for this. 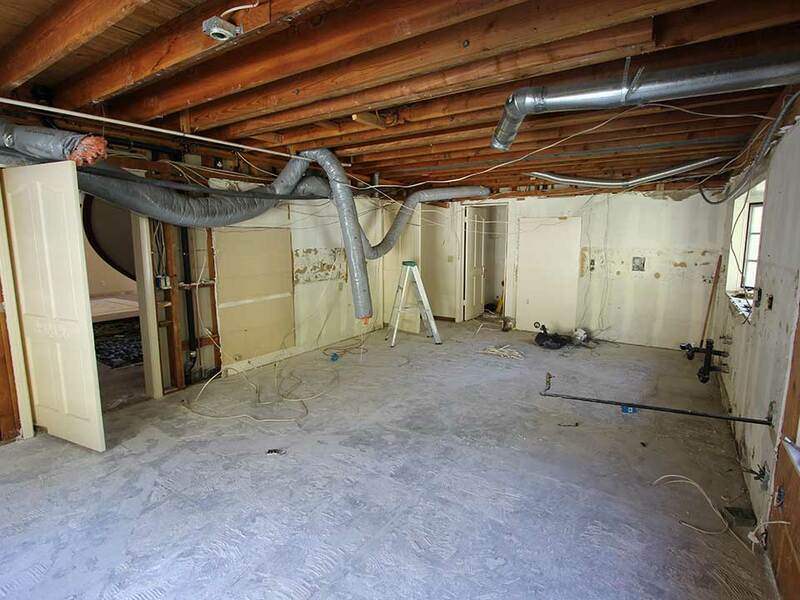 We first stripped everything down to the foundation and installed new materials. 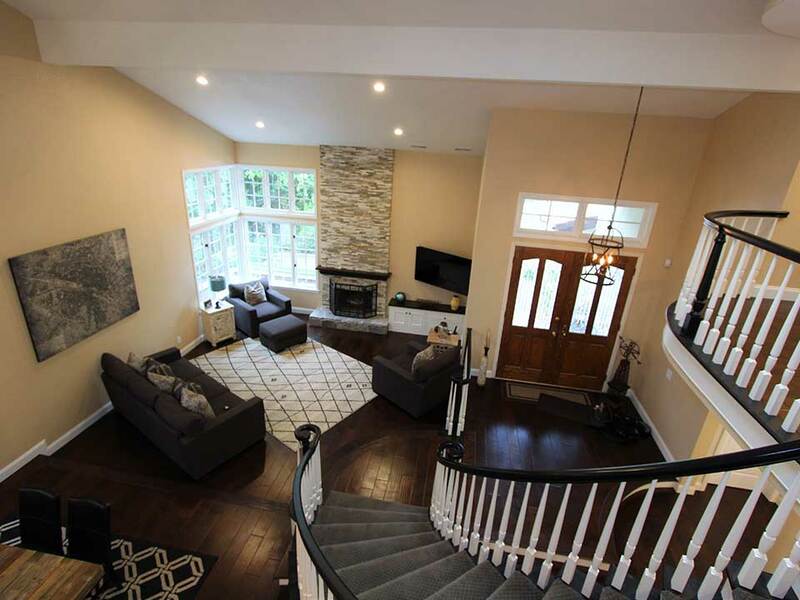 For the flooring, we went with beautiful hardwood planks from the Gemwoods California Classics collection, in Rancho Santa Fe Walnut. 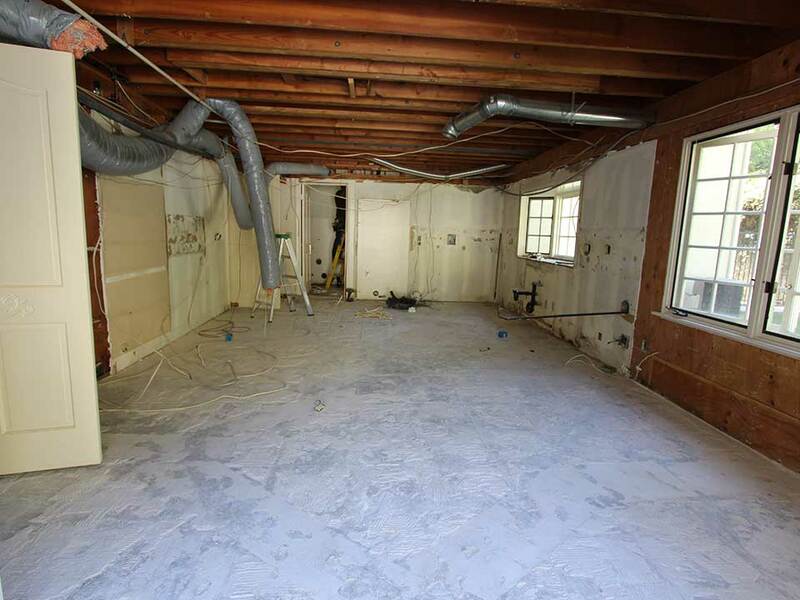 This flooring was extended throughout the rest of the home. 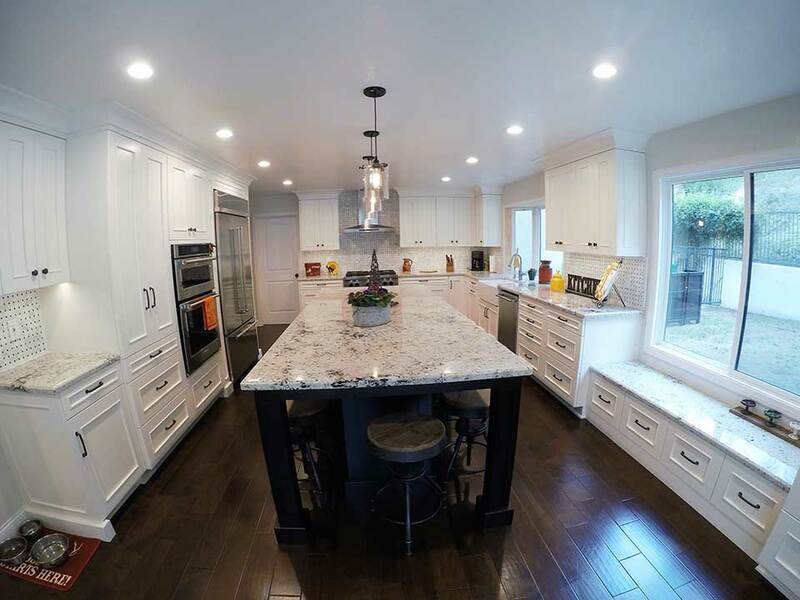 Next, we built and put in Maple custom cabinets in a Euro-style construction, with Shaker doors, Sonora moulding, and a creamy white DE Swiss Coffee finish. This light new tone reflects the light coming from the ceiling and outdoors, making the entire room feel fresher. We gave the cabinets of the long kitchen island a sophisticated Espresso brown finish, and incorporated moulded posts to make room for 5 stools. On the right, beneath the large window, the main cabinetry was lowered to create a bright bench area. A lot of texture is integrated through the use of a polka-dot wall backsplash, and speckled light gray granite countertops. These elements tie in well with the simple black hardware that accents the cabinet doors and drawers. Beneath the smaller of the kitchen’s windows, we placed a 33” Blanco Apron Front Farmhouse Fireclay Sink. Next to it is a 24” KitchenAid Undercounter Dishwasher. As the kitchen’s focal point, we installed a 36” KitchenAid Commercial Style Gas Cooktop beneath a 36” KitchenAid Wall-Mount Canopy Range Hood. A 30” KitchenAid Electric Built-In Microwave/Oven Combination and a 42” KitchenAid Bottom Mount Built-In Refrigerator are mounted amid the cabinetry side by side, giving the space a very streamlined look. The cabinetry of the center island also conveniently houses an appliance, the 24” U-Line Wine Captain Refrigerator. 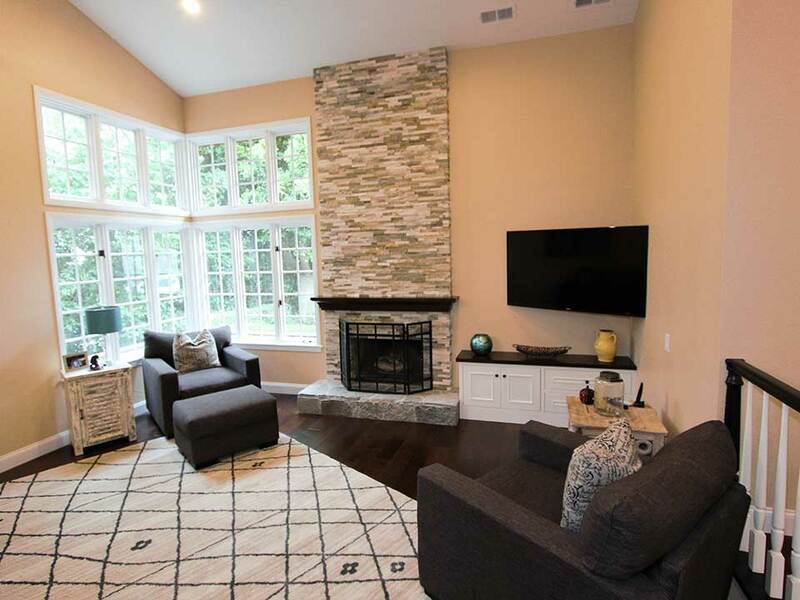 The home features 2 spacious living rooms. 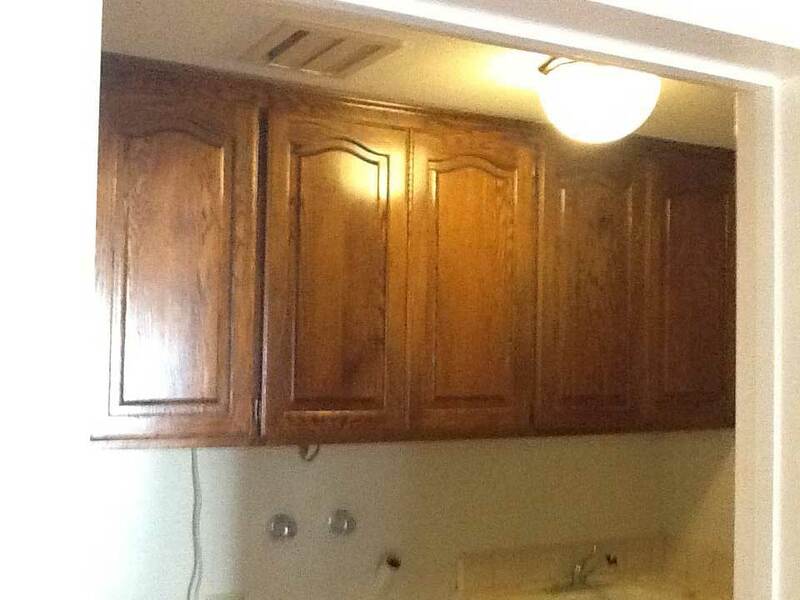 The first features a bar, where we refaced the cabinets in the same style as the kitchen. 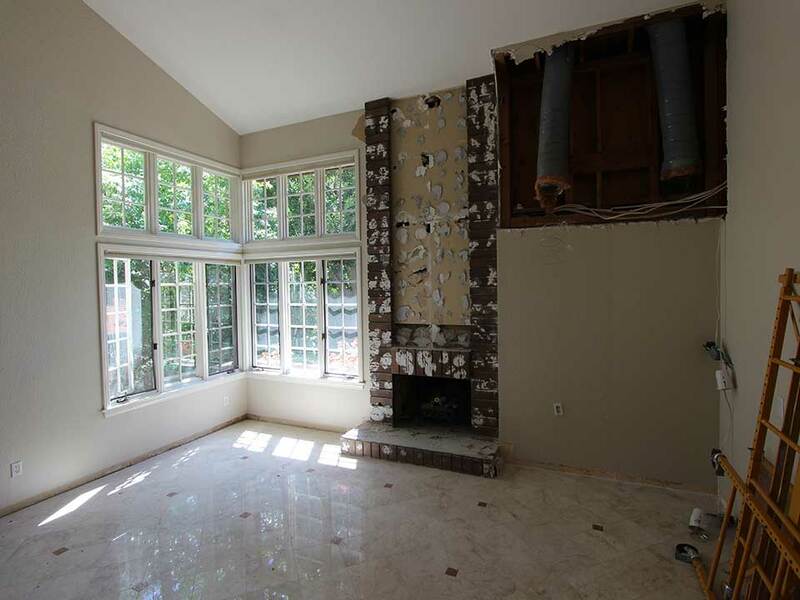 The bar looks out onto main living room area, which boasts a wide, handsome fireplace, refaced with Sparkstone Harbor Mist stone tiles, and set with RMQ Gold tiles from Thompson Design at the hearth. 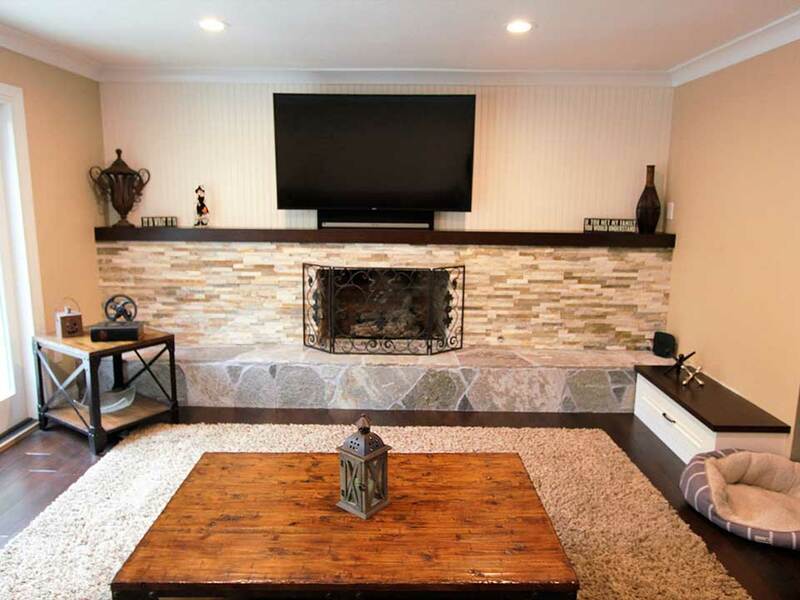 Formerly, overbearing shelves and cabinets here made up an imposing entertainment center, but we removed all of that to give the room a sleeker style and space to mount the large flat-screen TV above the mantle. A small cabinet compartment was built next to the hearth to supply a storage area. 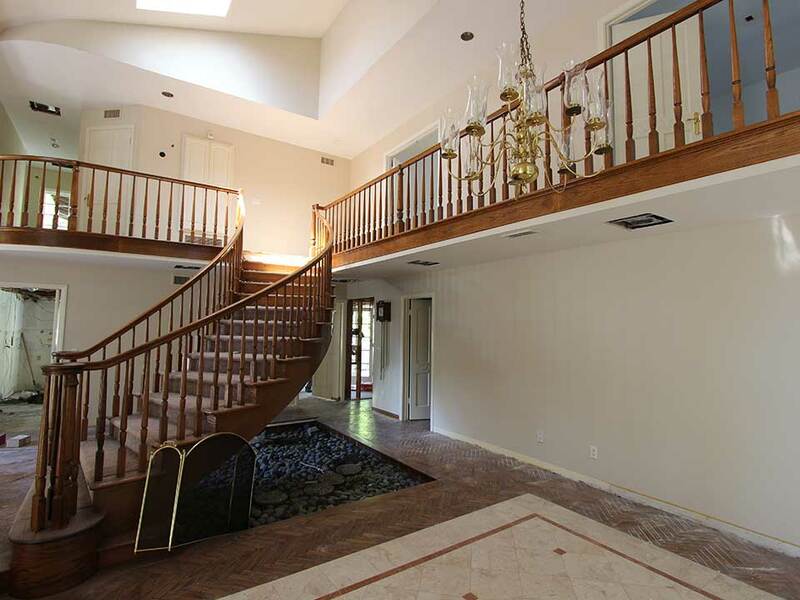 The other living room is set at the home’s entryway, in a sunken area at the foot of the stairs. It has a petite custom cabinet build below the TV. 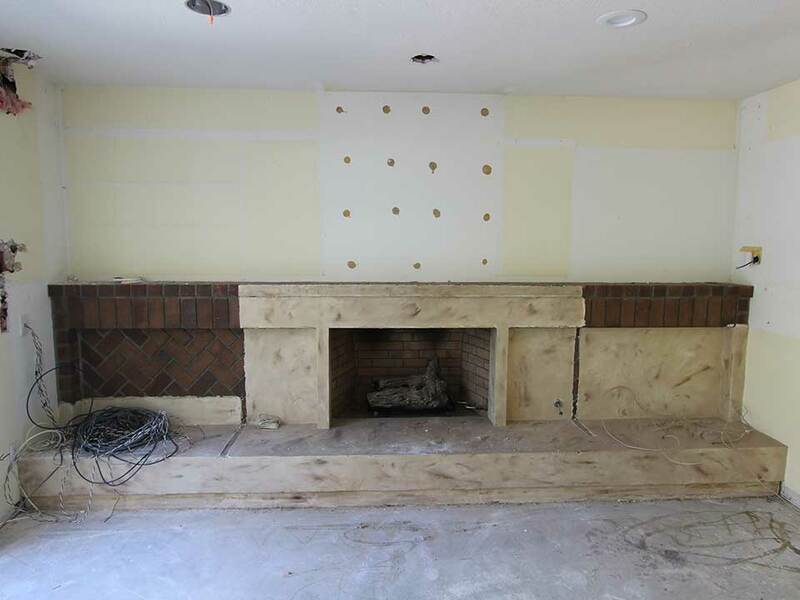 Next to that, we refaced the fireplace with the same stone tiling as that of the first living room’s fireplace. 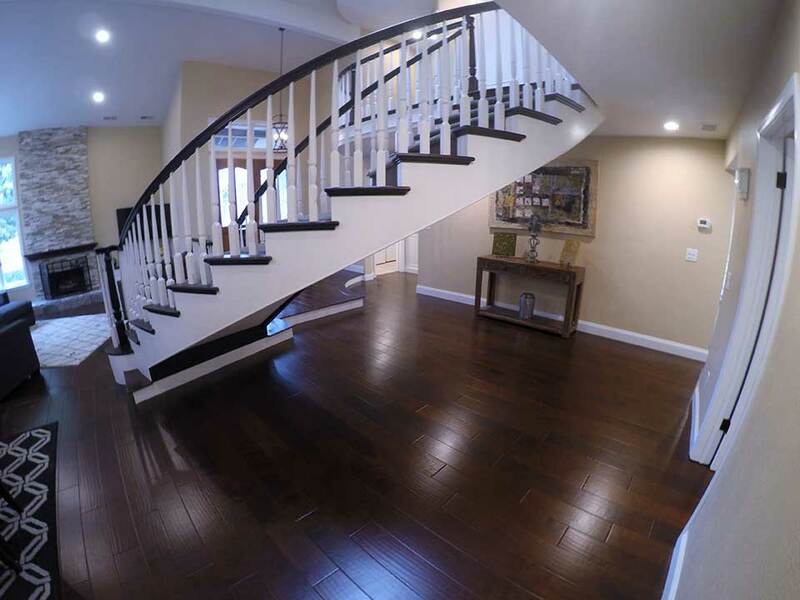 The stairs were updated with a contrasting balusters and rails. 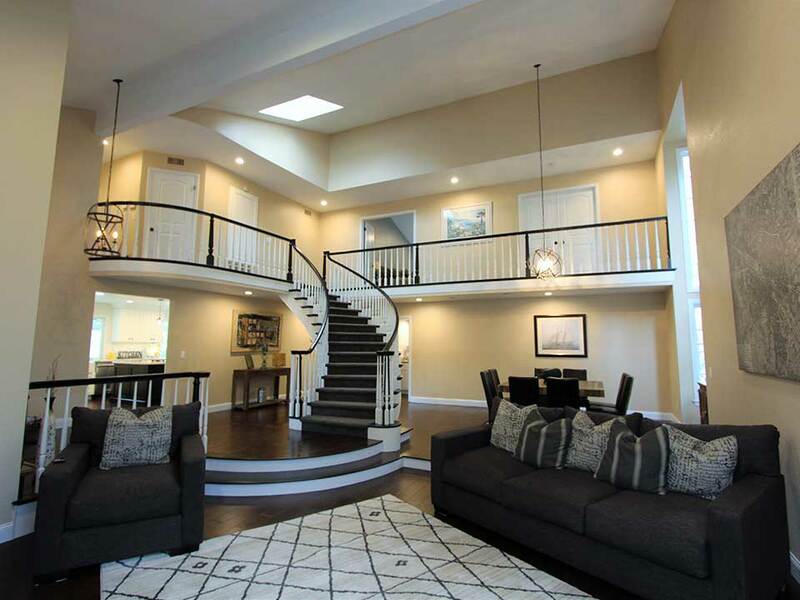 A glossy black finish on the hand rails pops against the white balusters, and enhances the sweeping curvature of the stairs and upper gallery. 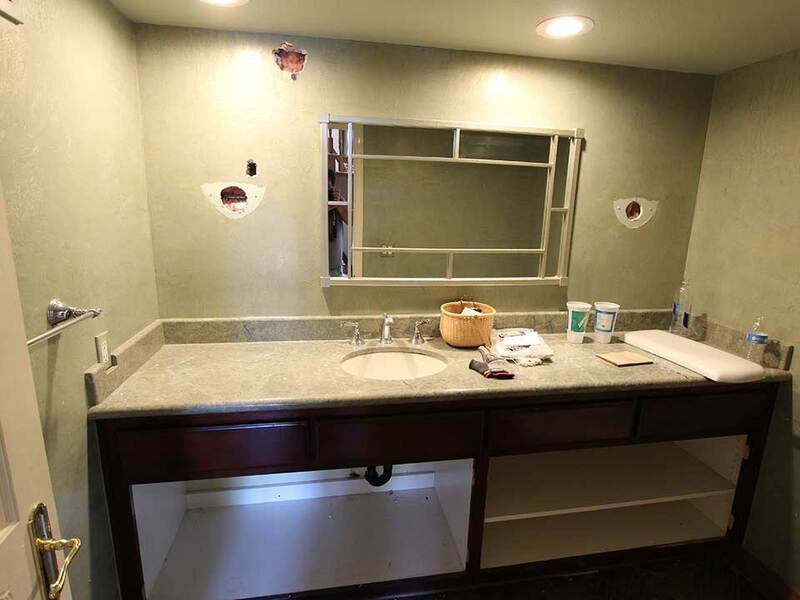 The subdued guest bathroom had its cabinets refaced in the same style as that of the kitchen and living rooms. Its countertop is a beautiful gray stone with a mossy green tint, extended a few inches upward along the wall to create a subtle framing backsplash. 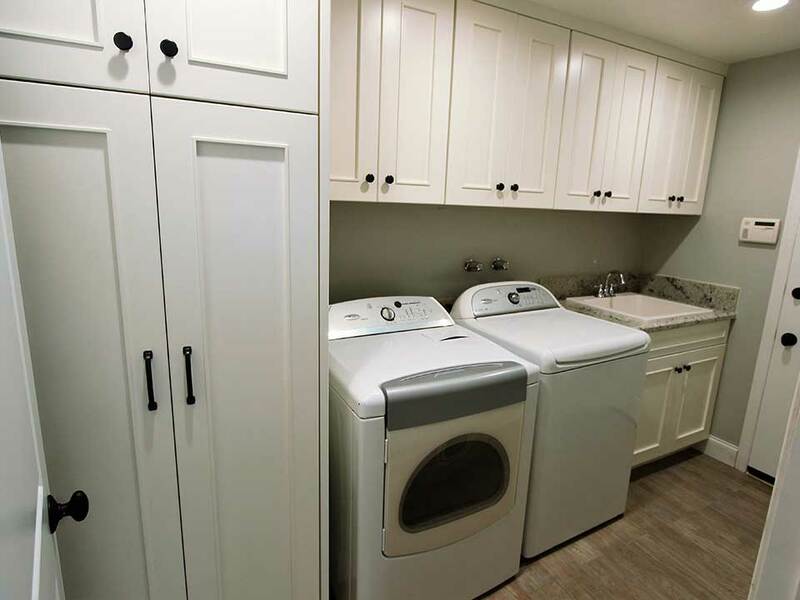 We outfitted with laundry room with all new custom cabinets to make the most of the available space. They are trimmed with 2 ½” Square crown moulding. Next to the laundry machines is a 25” MontBlanc Wakefield Dual Mount Natural Stone Composite Sink, mounted on a light gray granite countertop. 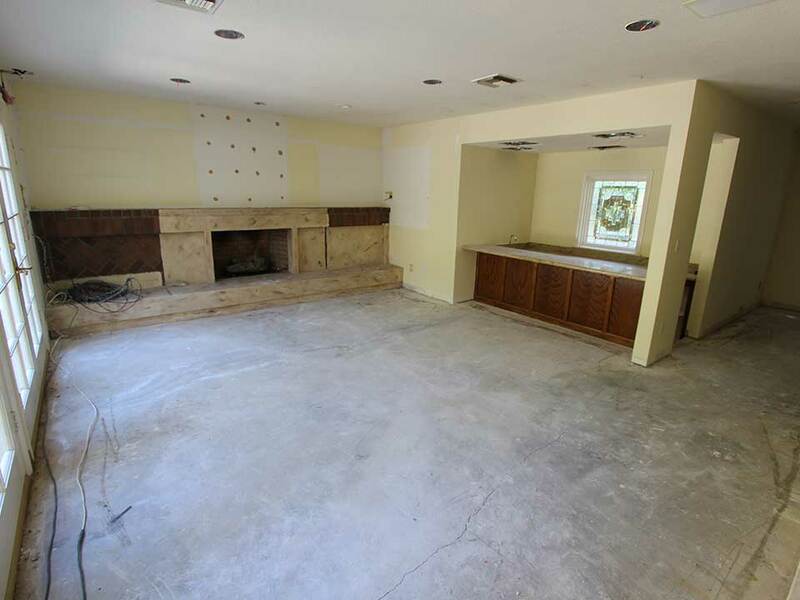 Considering a renovation for your Santa Ana home? 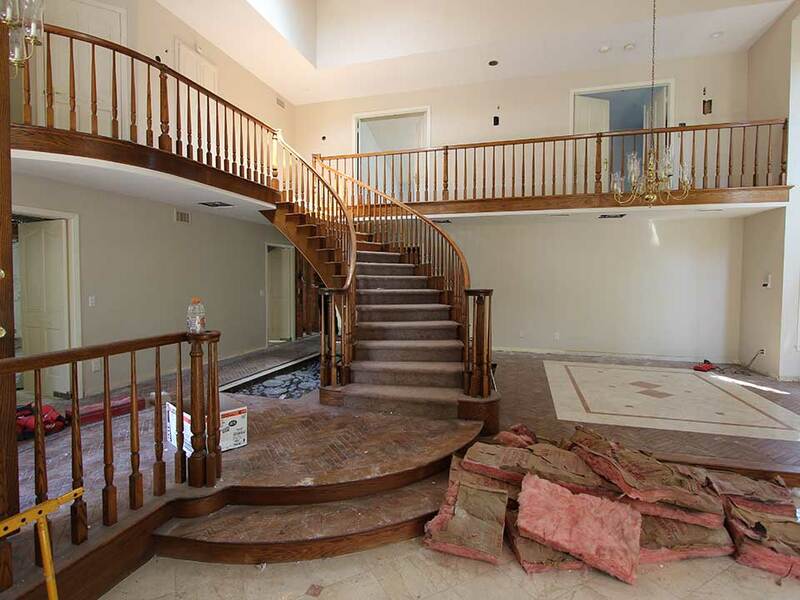 APlus contractors provides professional remodeling services for homes throughout Orange County. Get in touch with our team today for a free quote! Copyright 2015 - APlus Kitchen & Bath - APlus Interior Design and Remodeling - All Rights Reserved. Powered by Blogger.